Sifu David Bernhardt has been training in the martial arts for over 40 years and has immersed himself in the internal martial and healing arts for the last 25 years. David's love for movement and healing led to a devoted interest in understanding repetitive, unhealthy physical and emotional patterns held within the body. He decided to deepen his knowledge and skills by studying bodywork and emotional healing at the Acupressure Institute in Berkeley, California. The study of Asian bodywork, Buddhist and Taoist philosophies and the practice of martial arts, Tai Chi and Chi Gung, led to an even greater appreciation for the connection between the body, emotions and the mind. As a graduate of the Acupressure Institute he continues his studies with advanced education. He is a certified and licensed in acupressure and massage through the state of California. 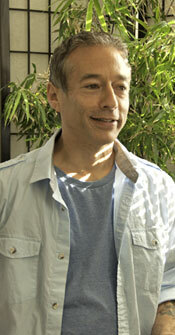 His practice and passions include the facilitation of healing through Acupressure, Tai Chi and Chi Gung. David has attained black belts in six martial arts styles. He received Instructor Certification from the Guang Ping Yang Tai Chi Association and from Grand Master Look, Moon Hung. He is a Gold Medal Champion in Guang Ping Tai Chi from the U.S. Chinese Koushu Federation and is certified as an Internal Martial Arts judge by Grand Master Look, Moon Hung. A teacher since 1978, David has taught on both coasts of the United States as well as internationally. Having spent his entire life immersed in arts including fine arts, movement and healing, David found it natural to develop a passion for anything that cultivated growth, connection, healing, creativity and joy.